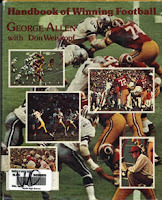 Last night I finished reading Handbook of Winning Football by Hall of Fame Coach George Allen. About 450 pages of football wisdom. It was published in 1975 but once you read it, you will realize why Coach Allen is a Hall of Fame football coach. Also if you are a Washington Redskins fan from that era you will love all the pictures. For all new youth football coaches that think they may not be good football coaches because they lack football knowledge, "Organization is the foundation of all successful football coaching. This is just as true in the handling of high school and college teams as it is in coaching play for pay professional squads. Organization is the basis for the whole game." Get your self organized find some good assistant coaches and have fun coaching youth football.